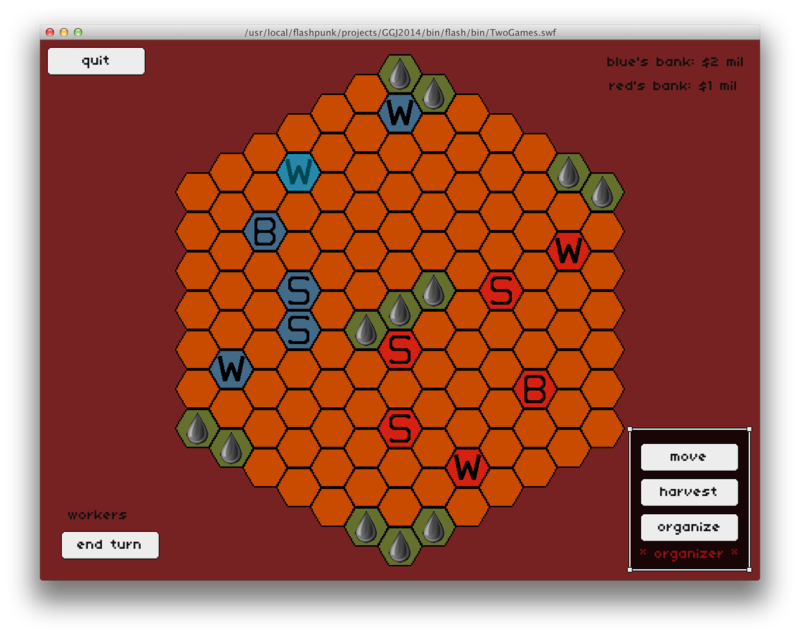 A strategy game in which two empires battle over resources, and a third player plays as the working class. Solidarity is a 3-player local multiplayer game. The first two players play as two empires competing for resources. They can harvest resources, train workers and soldiers, and attack the opposing empire. The goal of each empire is to wipe out the other empire. The 3rd player plays as the workers of both empires. This player's turn should happen in secret (with the other players looking away). During their turn the player may move the workers around to try and alter the course of the game. In addition, at the start of the game one of the workers in the world will be randomly selected to be an "organizer". Organizer units gain an additional ability, and can "organize" surrounding units, which turns them into organizers as well. The 3rd player achieves victory by organizing all workers (and soldiers) on the map.